Park Farm Pumas Red Under 13s are pictured before their 5-0 win over Glinton & Northborough Navy. They are Trevor Blackmore, Isaac Downie, Ollie Chapman-Thorn, Kai Jones, Evie Hatfield, Cameron King, Sead Zeneli, Austin Godding, Chris Adeloye, Cameron Love, Connor Leaves, Harvey Fletcher, Tinashe Chikwanha, Riley Sheppard and Dave Hughes. Yaxley Under 14s have bounced back into Division One title contention. 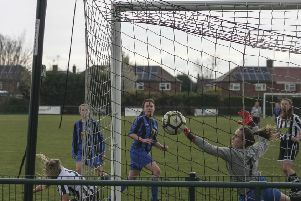 After losing 1-0 to table-topping March Town Athletic last time out, Yaxley needed a good performance at Spalding United Blue on Sunday to get back on the title track. Pictured are Glinton & Northborough Navy Under 13s before their 5-0 defeat by Park Farm Pumas Red. They are from the left, back, Jack Brearley, Luke Broadway, Callum Jesson, Jack Ray, Jamie Parker, Jacob Horner, Reuben Hinch, front, Finn Macaulay, Alex Smith, Harry Page, Charlie Rigby and Elliot Gee. And they did just that, taking the honours 9-0 to narrow the gap on March to 12 points with three games in hand. Max Hill claimed a hat-trick for the young Cuckoos with Morgan Hossack (2), Louis Rodriguez (2), Jamie Hall and Daniel Irving scoring the rest. In the same division, Feeder FC were also big winners. They were at home to Glinton & Northborough Amber and won 8-0 with strikes by Riley Taylor (4), Oliver Hatt (2), Louis Meadows and Charlie Pywell. In Under 14 Division Three, the big winners were Stamford. Action from the Under 13 game between Park Farm Pumas Red and Glinton and Northborough Navy. They roared to a 9-0 win against FC Peterborough and leading the way with a fabulous five goals was Samuel James. Jakob Domagala also bagged a hat-trick and Dan Greenfield made it nine. It was goals galore for Glinnton & Northborough Navy Under 12s as they consolidated pole position in Division Five with a 13-0 thrashing of basement boys Blackstones Green. Top scorer with five was Jack Yeardley and Devonte Malachi Butler and Charlie Shingles each claimed a hat-trick. Hampton Navy and Park Farm Pumas Red both chalked up good wins to maintain a stroing interest in the Under 13 Division Three title race. Hampton hammered Bourne Town Red 8-2 with Jesse Manu helping himself to a hat-trick, while Park Farm were 5-0 winners over Glinton & Northborough Navy courtesy of goals by Connor Leaves (2), Austin Godding, Tinashe Chikwanha and Sead Zeneli. IPTA are through to the semi-finals of the Under 12 Hunts Cup after a 7-2 beating of Stanground Sports. Logan Robinson (2), Freddie Marshall (2), Joshua Paul, Thomas Papworth and Kane Kirwan got their goals. Baston Under 16s were crowned Division Two champions on Sunday without kicking a ball. Although they still have three games to play, they were left with an unassailable lead after closest rivals Wisbech Town Acorns could only draw their game 2-2 at Stamford Red. In Under 15 Division Two, championship chasers Riverside Rovers spared lowly Stanground Sports no mercy as they kept their title push going with a whopping 18-1 win. It was 11-0 at half-time and 11 Riverside players got on the scoresheet. They were Leonardo Alves (4), Toby Charlton, Ryan Goodes, Alfie Greenwood, Jack Hutchings, Harry Jacobs (3), Fletcher Kirwan (3), Regan Murphy, Joranas Skutel, Archie Talbo and Yousseff Chahid. Under 15 Division One leaders Stamford also hit double figures as they beat Crowland 10-0 in a PFSDF Cup tie. Taylor Gilbert hit four of their goals to make it 18 for the season. In the Under 16 League Cup, Division One strugglers Yaxley pipped Deeping Rangers from Division Two 3-2 to make it through to the final. Alfie Webb, Will Chamberlain and Finley Kilby got their goals.